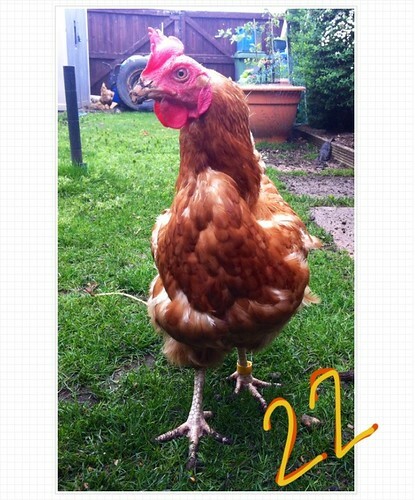 The other day we lost Chicken 22 to old age. She was clucked out, but had a fun and free life after we rescued her from battery farm hell. A lovely lady and one of the oldest we had. At the same time 22 reached her final days, a friend of a friend told Chris that she was moving house and needed someone to take on her hens. Yes, it writes itself… The hen numbers are back to where they were a few months back. 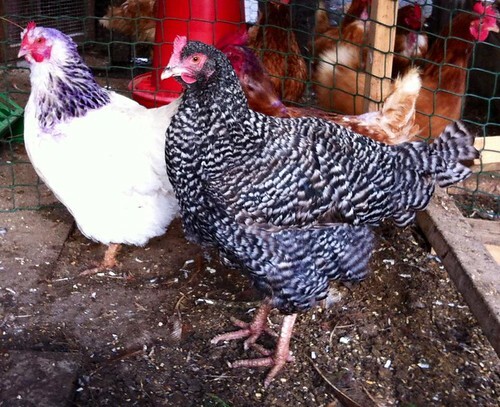 Lovely pets, and these two new girls are stunners! Chris picked up a new family member at the stables the other day. An injured bird had been hanging around for a few days, so with our birdy experience, Chris decided to nurse it back to health. Gregory Peck joined the madhouse. Now we know chickens are clever, but this guy is worlds apart. You can see him think… he looks at one thing, then moves on, then back to the other thing…. 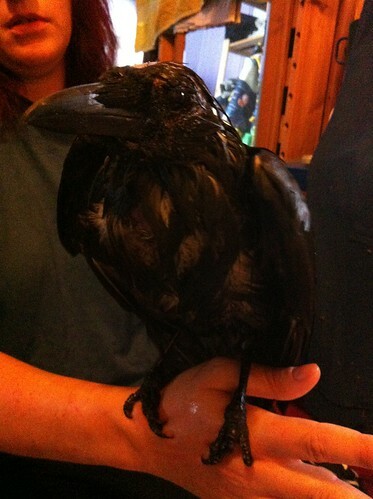 and you see the thought process… He’s not the largest crow I’ve seen, but he’s still a big lad. He’s been in a fight. Maybe another bird, birds, fox… car? and he has an old scar across his back under his feathers and his head is half bald. This scar may be pulling his skin when he tries to fly, as he doesn’t seem comfortable getting airborne, even though his wings are fine. 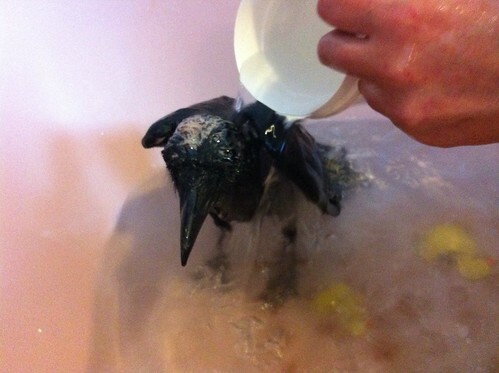 He has a mild chest infection, and is a bit bug infested, so he is going through some bird nutrients and a bathing ritual to clean him up. He already looks a lot better. 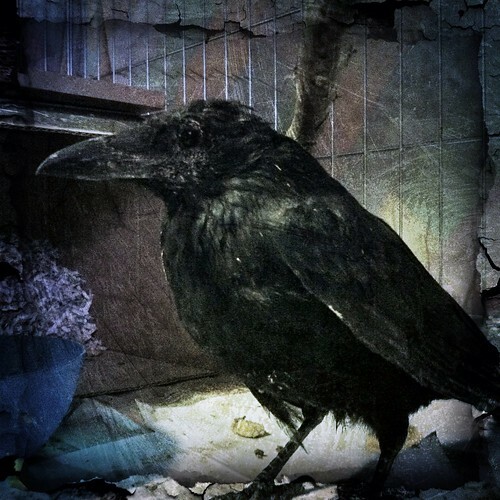 Corvids are among the most intelligent, if not the most intelligent, of birds. Peck has shown this by completely accepting us as friends. Day one and he was very wary and pecky to us. Day two, after food, bath, blow dry and mite powdering he is easy to handle and no fuss at all. It is said that crows have very good memories and facial recognition, so if you cross one or mistreat it, it won’t forget. 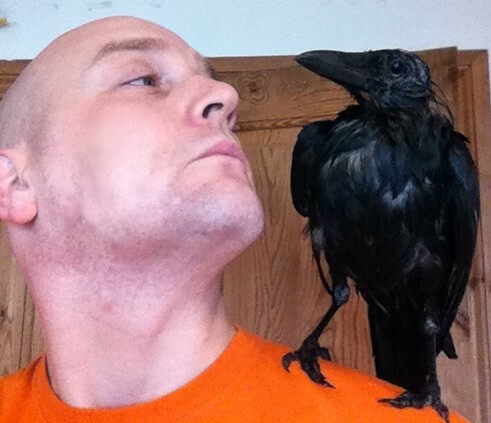 From a shy, scared and pecky wreck, he now sits on my shoulder with out a care. 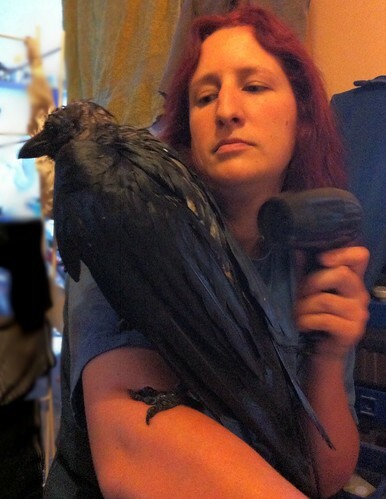 I am a fan of E.A.Poe – and my own verse lead to my nickname becoming “Raven” back when I was heavily into the motorbike scene. The guy who named me “Raven” was one of my closest friends (Ryan “Ox” Brown) – and he sadly passed away well before his time. As a mark of remembrance to him I officially took “Raven” as my middle name. Most people knew me by the name back then anyway. I digress… or not…. I wanted to write something with a tale to it in a similar way to Poe, and this is what I came up with many, many years ago (’95 I think). It constantly gets tweaked, and this is the latest (2008) version. This tale, of how he came to die. He was unaware of those he’d offended. He was a corporate climber bold! He had no fear – his heart stone cold! He settled to a restful night. Aware of not where terrors lurk. Then a knock upon his window came! Then another – just the same! He sought solace in a measured powder. To wait for him to go to bed. 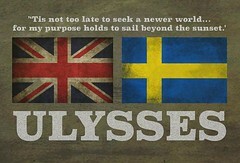 Though his heart now sped beyond belief! And waited for his fear to pass. Fear turned the sound to Demons singing! He raised his ‘phone….but still the ringing! A siren? A siren from beyond his wall! A car alarm – and that is all! Slowly filling him with dread. He froze in horror – disbelief! These faces, that fell before his eyes. Then once more the knocking started! Although his fear just wouldn’t hear it. Then again the ringing sounded! His head spinning – quite astounded! Like a fan fare for The Reaper. “Show your selves!” he screamed, he cried! As fast approached his judgement day. Faster filling him with dread. Faces to whom he had lied. “You betrayed us! – You destroyed us! Just to force yourself above us! That’s all you gained and nothing more!!! “I left you all down in the gutters! “Never! Never!” A frightened cry! “You can’t tell me that the Devil lied! And in his chair, began to cower. To save his life he knew not how! With scythe, hung neatly, down his back. They sent him to his final bed. Now his last promotion saw him dead. Into the burning depths of Hell.